James Tisdale is a Resident Artist and Ceramic Education Coordinator at the Austin Museum of Art. 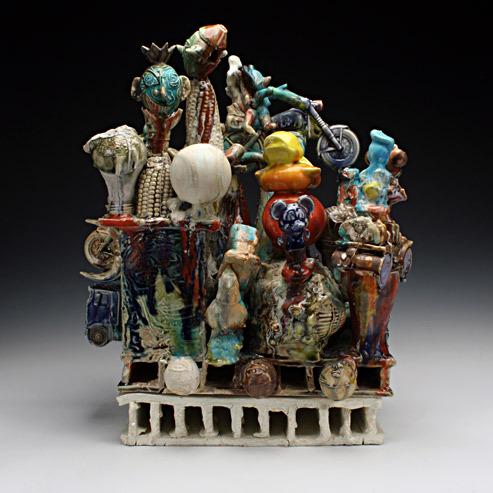 His position with AMOA has allowed him to participate in several residency programs in the US and across the globe, even teaching at the International Ceramic Studio in Kecskemet, Hungary. His allegorical, biographically inspired figures have been exhibited internationally and most recently his work was featured at SOFA Chicago. Red Lodge Clay Center is proud to welcome Tisdale back to Montana after twenty years. We are also excited to have the opportunity to collaborate with him on this exhibition. “Silhouettes” presents an intimate, yet diverse display of contemporary, figurative ceramic sculpture. The figure has had a pretty interesting run throughout the history of art. More than once this icon has been declared “DEAD”, only to rise again thanks to the undeniable hubris of the human condition. We will always grapple with ourselves and so we will always have need to view ourselves through the varied, external, interpretive lens of the maker. Some of the artists in the exhibit honor the classical rendering of the figure to explore the human condition, while others abstract surface and form to exploit psychological underpinnings or to celebrate frozen moment narratives. Humor, history, mythology, and anthropomorphism inform these objects in a melange that is only possible in modernity. It’s easy to forget that the salon once vilified deviations from the representational figure. Now such deviations are not only accepted, they are the exemplar. Debates between protectors of tradition and those reaching for innovation are applicable to many fields and it is an opportunity to examine our own boundaries. Humanity has primordial ties with the material of ceramics and a seemingly primordial impulse to recreate our likeness in the plastic mud. The figure serves as human proxy and as divine proxy. The figure functions as icon and catharsis. It is a way for us to try catching lightening in a bottle. The collective “we” can redefine ourselves through the figure. Through the figure we can be immortal.